It hasn't rained in probably a month at least and the ground is cracking and it is really dusty when you try to do anything. Before our friend came to visit I watered all the little trees in my arboretum. This is also the time for planting stuff I need for erosion control - if it is raining when I install them they get washed away, but putting them in now means I need to water. I have moved around and divided some plants and put them in the river bed near the bridge. 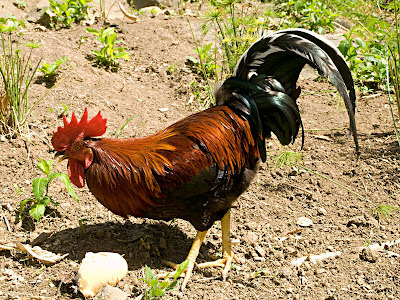 While I was out there a new chicken showed up and he is absolutely gorgeous! He is pecking around some philodendrons I moved but I don't care. He is big, and shiny, and has a nice comb. 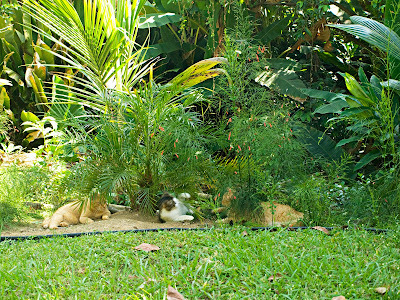 Elsewhere in the yard the cats hang out under the firecracker plants that are under the Robelenni palms. There were three of them out there and they were on the bridge for a while watching the big chicken. 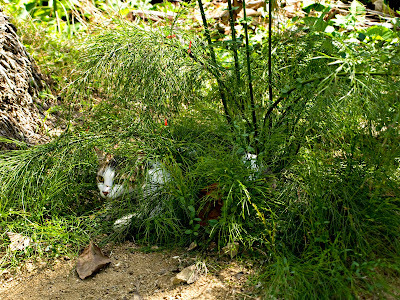 Tuca was snaking around under the firecracker plant which is a good plant for erosion because where ever it touches it roots. This plant is also likes dry spots (once you get it going) and has lots of nice flowers. My garden is pathetic. I have given up and am not gardening much. In June I will figure out if aquaponics is the answer and start growing better stuff then. 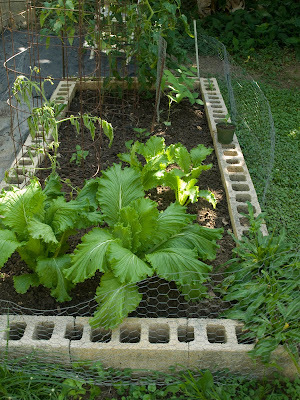 For now I have some really tough bok choy, some tomatoes that something got to and cucumbers which always do well. I love this white shrub that looks like an umbrella. Don't know what it is called but it is really nice. The leaves are dropping off of everything and things look really ratty except for the heliconias which are in full bloom. These blooms last for a couple months at least and I have divided and placed them all around the yard. The corazon fruit tree is giving us some fruit and the papayas and guineos are abundant, chinas are two pitchers of juice away from being done and the yucca isn't ready yet. We do have 6 or more calabaza and it is a good thing they store well. The mangoes are not blooming yet but I do see buds on the aquacote. One nice rain will change it all but I just don't see it happening. The nice thing is the breeze and the 66 degrees at night. Bad thing is it is in the 90s and only 45% humidity - dry dry dry! I can feel my skin shriveling up. 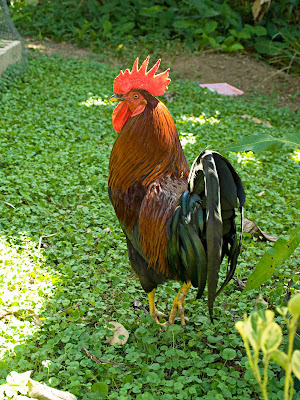 So I do what I can in the yard which includes just watching this really cool rooster hang out. 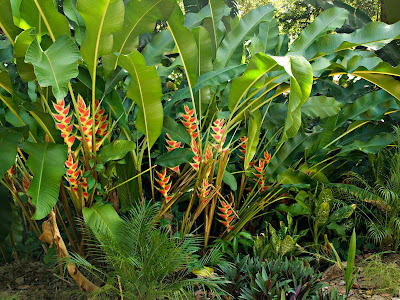 Even though it is dry there, your plants are still looking nice...and green. Awesome pictures as always! 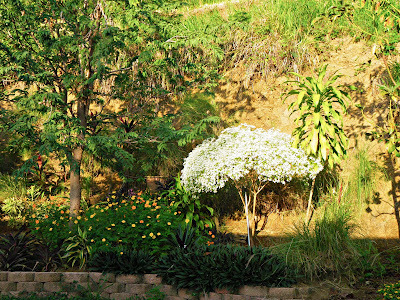 The white umbrella-like shrub was given to Mom by her sister. She has never seen it before anywhere. Please let us know if you find out what it is. It sure is a nice specimen and seems to do really well in your area. PS We just watched a movie called "Food Inc" and it was an eye opener -- we strongly recommend it! Here is a good article in today's El Nuevo Dia newspaper about organic products. It lists several markets around the island that specialize in organic products. Cueva Sorbetos - Que Linda! Restaurant Review - Good Food at Last!! !